Then I think your in the right place. If you’d like some some easy (and I mean real easy) encouragement for your heart and for your home – same goes. Mostly I tell stories about making this house I live in home and other things that have my heart – these children, this family, this faith, this moment. There’s some good stories here – I hope I tell them well. Mostly I hope that you’ll leave here with a lighter heart then when you arrived and with a few ideas for doing what you can with what you have, right where you are. I hope you’ll leave here knowing this as well – your pretty amazing. I’ve long been obsessed with all things house and homey – rooms and spaces and windows and walls and fixing them up and making them look pretty. I’ll quite happily do that anywhere at any time but this little house where I home has swallowed me whole. I live in Wollongong, NSW an hour or so south of Sydney. We moved here in 2005 – full of big plans, some that we have seen through, some that we are still working on and some that have sat back and laughed at us. She’s a work in progress and I am too. A perfect match. You can read more about that here and a bit more about this little family of mine here . So if I were to sum up what I hope my home to be, I’d say easy on the eye and inspiring to the soul. Lovely in a way that demands little and gives much. Some days I succeed, some days are iffy and somedays I wonder why I bother at all but what I’ve found out over the years is that a big budget, big skills, big time and big smarts aren’t necessary to put you within shouting distance of a pretty home. I worked out as well when I wrote this post that my homes purpose like my own, isn’t to impress or compete its purpose is to embrace. I love a creative project but more than that I love seeing what I can do with what I’ve got. Same goes for taking something old or unloved or plain ordinary – a room, a wall, something I found in my garage, at the back of the thrift store or beside the road and wooing it back from the brink. There’s some of my story there. No expert skills, no big budget either, mostly trial and error and just giving things a whirl. It seems we often look for the big changes and the gigantic answers and the total makeovers but they come along only once in a while – if ever. Give me small steps taken often that add up big differences – in our homes, in our families, in our faith. We have a big God who works His wonders within the small smallness of our hearts. And aren’t our big life stories mostly found in the small life moments. I have two little (not so little ) lovelies and one big one. My children are 15 and 12. Ethan is almost a man, taller than me now, he’s sweet spirited boy but oh he has a naughty streak and comedic timing like you wouldn’t believe. My oh my does he ever keep me guessing and wondering and praying. Olivia, sweet Olivia, she skips and sings and twirls and giggles her way through life. I still cant believe I have them and never stop being grateful to God for them. My “big lovely” fits into that category too – – – a good husband, a really good daddy and as imperfect and challenging and annoying as they come most days. But grateful for him – no end. He keeps us laughing and often dances in the kitchen with not much on. He is my biggest fan, always pushing me to follow my heart. He’s unique, he’s a challenge and he is in every way, for better or for worse – “the one”. But right here in the place of my greatest joy lies the real challenge. See I’m always gonna make thing’s look nice and work well wherever and whenever I can because it’s what I love to do – that bit comes easy – but we all know that don’t a happy family make. See the kids don’t care what colour the curtains are or how clean the kitchen is but they do want to feel safe and loved beyond limits, they want to have fun and run around the house shrieking, they want adventure and to be heard, they want a warm cosy bed and open arms and lot’s of food – that fella I’m married to as well. I pinch myself that I have the privilege of it and I wouldn’t trade any of it for anything but let’s face it its jolly hard work and its noisy and chaotic, crazy and exhausting. I feel in over my head by a long way, still in awe that I get to do life with these three and mostly just figuring things out (or not) as I go. 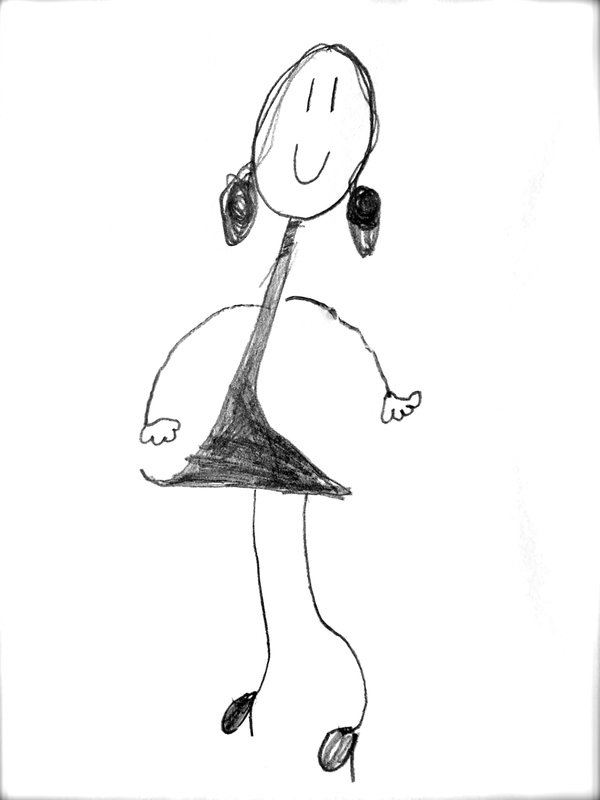 This picture my sweet girl drew of me always makes me smile. What’s not to like – looks like I’m wearing high heels and a little black dress. I’m thin, my hair is styled (it never is) I’ve got a smile on my face and I just might be dancing or if not I’m striking a “hey life’s good” kinda pose. Oh God bless little girls who always see the best in their mama’s. These taken a little while ago – Ken’s thinner, I’m not – all good. This blog is where I get to combine my love for a creative project, my obsession with all things house and homey and my life long passion for stringing words together. Where it leads remains to be seen. It’s the doing I can’t do without. My hope is that you’ll find some simple, genuine inspiration here for your heart and for your home. Join me – we can talk long, drink coffee and get all inspired together. Love from my home to yours. Thanks my friend. Another way for us to chat. nice blog and write up about yourself. Good job. Thanks so much Sharon – really appreciate your comment. I love your ending phrase “You and I – we are uniquely ourselves, uniquely gifted, uniquely qualified, loved, chosen, here in this skin, right now for the beautiful God given, God breathed purpose of reflecting Him in this world.” Powerful words! Thanks so much for coming by Sheryl!! I was going over today’s blog; I thought oh! we have a lady after our own heart. Has a lovely home that looks and feels like home. And on the days we can not get everything done; we got the dinning rm table to put stuff on. So real , so true, and so comforting to know we can dream Jackie is setting the table ; it could be for us to just sit and dine or just a dream one night I am going to feel like that. Thanks God that He gives us what we can handle and oh! all He desires for us to ” Be still and know He is God”. There are days the dishes can go and we just need time with family and time for ourselves to just enjoy God’s Presence in the day to day routine of life. Thanks so much Linda for stopping by – some good thoughts there. Tracey, I answered your question on the Blogger’s Pit Stop and I have realized that I have not transferred my commenting system to the new site. Posting, any family friendly post new or old is welcome. Best to leave at least one month between sharing the same post for a second time. So go for it. Boy has blogging changed over the last 10 years. I love your welcome. So glad I am finding so many wonderful, inspiring, blogs. Thanks for stopping by my world. And thank you for stopping by mine. Yes FMF and other link ups are always good for finding fun and interesting blogs. Yours was one.